The start of talks, if they happen, will be a hopeful sign. But there’s plenty of reason to be skeptical. Skepticism abounds, and it’s not promising that Martin Indyk might lead the American side in Israeli-Palestinian talks that, it seems, will begin after six visits to the Middle East in six months by Secretary of State John Kerry. But the start of the talks, expected to last at least six months, is a hopeful sign. The secretary of state told Mr. [Mahmoud] Abbas [the Palestinian president] that the Israeli government had agreed to quietly halt building in Jewish West Bank settlements, but wouldn’t make any public announcement to that effect, according to the aide. He said [Israeli Prime Minister] Netanyahu had also pledged to release some Palestinian prisoners before the first day of talks in Washington. Mr. Kerry gave Mr. Abbas his own guarantee that peace talks would resume on the basis of Israel’s pre-1967 borders, the aide said. Still, just getting the talks started isn’t the objective. The objective, of course, is the creation of a sustainable, financially stable, militarily secure Palestinian state that can create a viable future for people who’ve lived under military occupation for decades or who’ve been scattered as refugees since 1948. That’s certainly not an outcome that Israel desires, and it isn’t clear yet that either Kerry or President Obama see that as an important national security goal for the United States, either. 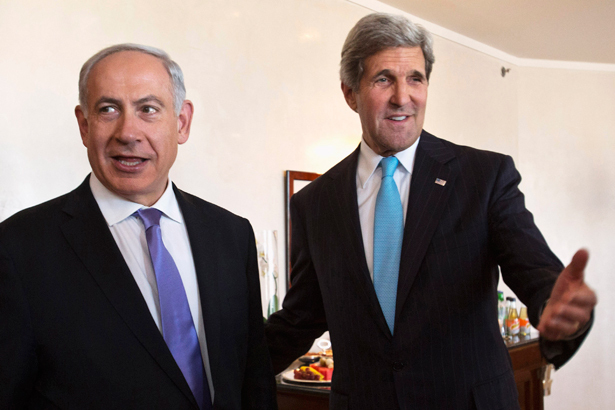 Kerry has created a framework that, he seems to believe, will move the talks forward. He’s engineered a vague, but promising $4 billion economic development plan for the Palestinian territories. He’s mobilized military experts, including a former US commander in Afghanistan, to work out some sort of military-security plan for the West Bank, aimed at overcoming Israeli fears about a Hezbollah-like threat arising there. He’s dispatched technical experts to work on the knotty issues, such as refugees and borders. But we’ll have to wait to see if the two sides have agreed to talks, under pressure from Kerry, just to please the United States, or if they’re willing to move forward. It is … possible that Obama will show more spine than he did during his first term and that he’ll get sufficient cover from groups like J Street so that he can pursue a more effective approach. That approach is going to require a combination of bribes and pressure: Kerry and Obama will have to convince both sides that a bright future is ahead of them if they can end the conflict and focus instead on economic development, but Kerry and Obama are also going to have to make it clear that things are going to get worse for both sides if they don’t. The negotiation table will be round, with a hole in the center. Representatives of the Palestinian Authority will be seated in the center, while Israeli representatives will sit outside and surrounding the Palestinian delegation. The table size will be adjustable, allowing the center to shrink and the outside perimeter to expand indefinitely, at the discretion of the Israeli delegation. The Palestinian delegation will be expected to tighten their belts and/or reduce their numbers as needed in order to accommodate Israeli adjustments, and may not add cushions to their chairs without Israeli permits. Achieving a two-state solution is a vital US national security interest and would inject much-needed stability into an increasingly unstable region. It would deal a setback to extremists and terrorists around the world who have exploited this conflict to mobilize support for their violent methods. We know that difficult days lie ahead but we are convinced that with persistence, creative mediation and international support, a deal is within reach. J Street, I’d say, has it about right. Still, after countless previous tries, the odds are that not much will be achieved. Which would be a shame. Daniel Levy on the future for the non-right in Israel.